The first 30 seconds of the session will be a shock, the warming red light is very bright, which I’ll remind you with a gentle tap on the shoulder, “get ready for the light”. You will wear the recommended small goggles to protect your eyes, because the light is quite intense initially. Once you relax and your eyes get used to the light, its just like lying under the warm sun (without the harmful UV of course). Most of my clients fall asleep during the treatment. You’re probably wondering why my clients put themselves through such a startling few minutes on the beautician’s bed at my JOI Pure Natural Beauty Clinic. Here’s the part where I tell you that my clients come back time and time again, it’s that good. After a session of the revolutionary Omnilux Revive light therapy you’ll crave the results that appear the next day: Plump, dewy, bright, virtually pore-less and ridiculously glowing skin. I recommend a course of eight combination treatments, once or twice a week, in order to guarantee the best-looking skin you’ll ever have. Many of my clients suffer from various skin conditions as well as aged skin. Omnilux Revive and Plus, address these areas of need. The lamp sits over the face for 20 minutes per session, and is most effective following a bespoke JOI Pure facial or double cleanse and exfoliation. While the first 30 or so seconds with the Revive feels intense, you’ll soon relax and either fall asleep or start imagining yourself on a tropical island with the warm sun on your face. Only this heat is the opposite of damaging — it’s actually mending all the naughty days you’ve spent sans-sunscreen! The light works with the body’s own processes of counteracting ageing and sun damage. Revive is a red LED light that stimulates collagen and acts as a non-invasive anti-inflammatory agent, but there’s also a near-infrared light called Plus for the healing and tightening of tissue. These two work best in combination, alternating with each session. To touch briefly on the mechanics of this miracle light, each one has 1700 diodes (a diode is a two-terminal electronic component with asymmetric conductance but who really cares about that) which each release a wavelength of light specific to the skin condition being treated. 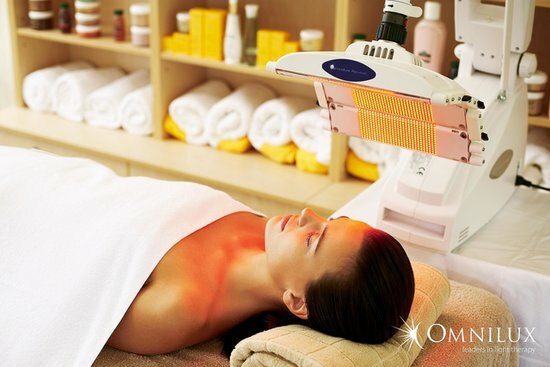 While it’s kind of interesting to know how Omnilux light therapy works, all you really need to know is that it is a game-changer. Or more specifically, a skin-changer. Treat yourself to a course before your wedding or any important event or just to give you skin a boost, and watch yourself tell anyone who’ll listen about “The Light”. Please feel free to contact me for more information or book a session at my JOI Pure Natural Beauty Clinic.